I made sure to keep an eye out for falling stars last week on my pre-dawn delivery route since it was during the peak of the annual Perseids meteor shower. One morning was pretty socked in with clouds and/or fog but most of the rest of the week was pretty good. 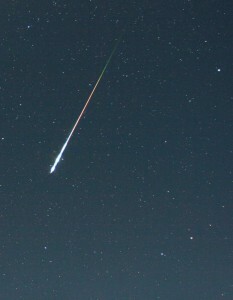 Still, I only saw a handful of meteors. The whole “keep your eye on the road” thing didn’t help but one would think if meteors were falling at the rate of one per minute more streaks would have caught my attention. Sadly, what did catch my attention was how much light pollution is evident across Western North Carolina. My route starts out near Patton Avenue in West Asheville and as might be expected, that is pretty bright. Then I head out to Enka-Candler along US 19-23 and continue to Canton and then Waynesville, then on to Sylva and Bryson City, then backtrack to US 441 South over Cowee Mountain to Franklin. The four-lane through Enka-Candler is ablaze with convenience stores and/or gas stations plus all the closed businesses have “night” lights on. Of course every community (Canton, Waynesville, Sylva, Bryson City and Franklin) are all aglow, but even the highways and byways between are lit up like bright ribbons, with gas stations, firehouses, churches, subdivisions etc, etc. And so much of that light is shining or reflecting up into the night sky. I received an envelope with a handwritten note (didn’t know people still did that) back in June from one Janice Ander (I hope, I got it right) of Bryson City with some great info regarding dark skies and some of the organizations around the country that are working to address the issues. There are myriad reasons to advocate for dark skies, but simplistically it boils down to the way life on Earth evolved; darkness is as important and integral to the dance of life as light. We need both – the species and ecosystems we share the planet with need both. Mammals – decline in reproductive success; increased mortality from impairment of night vision. Amphibians – decline in reproduction; confusion of natural instincts that protect from predators and the elements. Insects – interferes with mating and migration – which in turn impacts species that depend on insects as a prey base. Birds – around 100 million birds die annually from collisions with lighted buildings. I’ve seen reports of Tennessee and Cape May warblers being spotted around Western North Carolina – a sure sign that fall migration is beginning. In a few short weeks the night skies will once again (as they have for millennia) fill with migrating songbirds. It’s sad to think of what a treacherous gauntlet they have to run. Ms. Ander sent information from wwwwewatch.org and www.darksky.org. Audubon has a great program called lights out – www.audubon.org/conservation/project/lights-out. Dark skies are cool skies!